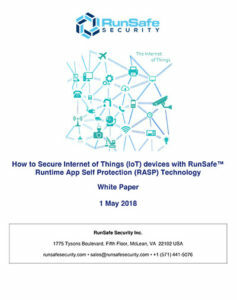 This paper focuses on adding protection from cyberattacks directly to binaries, rather than relying solely on external detection methods such as firewalls, gateways, IDS/IPS, and antivirus. At each step, a comparison with traditional approaches is made with legacy tools, considering security effectiveness, investments of time, requirements for specialized skills, and access to computing resources. ICS modernization coincides with burgeoning smart device connectivity, the proliferation of the Internet of Things (IoT) and the Industrial Internet of Things (IIoT), predictive analytics, and data sharing via the cloud. 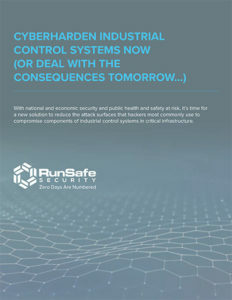 RunSafe’s Alkemist offers a practical approach to Cyberharden ICS and embedded systems and devices. 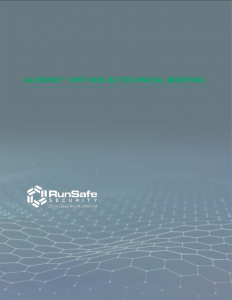 Systems running firmware, apps, and OS protected by RunSafe Security’s Alkemist are better able to document their compliance with RMF (DoD1 8510.01) which incorporates NIST 800-53. This paper describes how Alkemist resets the security baseline to the defender’s benefit. 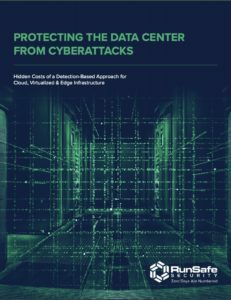 In today’s heightened threat landscape, the traditional data center security model of perimeter controls and detection-based models does not prevent sophisticated attacks on virtualized IT infrastructure or the OT firmware and software that supports it.